A Birthday Wish for Mickey Mouse! From one icon of early animation to another, Betty Boop, and all of us at Fleischer Studios, wish Mickey Mouse a very happy 90th Birthday! ​Although they were brought to life on opposite coasts, Betty in New York and Mickey in California, they made their first appearances on the silver screen just 20 months apart: Mickey in Steamboat Willie on November 18, 1928 and Betty on August 9, 1930 in Dizzy Dishes. Both films featured great music, hilarious hi-jinks and just enough mischievious fun to keep us coming back for more. Though Disney and Fleischer were most often viewed as competing studios -- and they were indeed competitors in the marketplace -- the two studios had a number of talented and imaginative animators in common. Animation was still a relatively new medium in the 1930s, and it was not uncommon for animators to move from one studio to another and sometimes back again. In fact, when Max Fleischer visited Disney during a trip to California in 1956, he had lunch with an entire table full of animators who had once worked with Max and who, in 1956, were working for Disney. Even Max's son, film director Richard Fleischer, worked with Disney! It was 1952 when Disney offered Richard the opportunity to direct a film for him but, as he relates in his book Out of the Inkwell: Max Fleischer and the Animation Revolution, he felt he couldn't take the job without first getting his father's blessing. "You go ahead and take it," Max told his son. His message to Disney: "You tell Walt one thing from me... that I said he's got great taste in directors." As it turns out, Max was quite right. 20,000 Leagues Under the Sea, directed by Richard Fleischer was a technically remarkable and wildly successful Oscar-winning film. 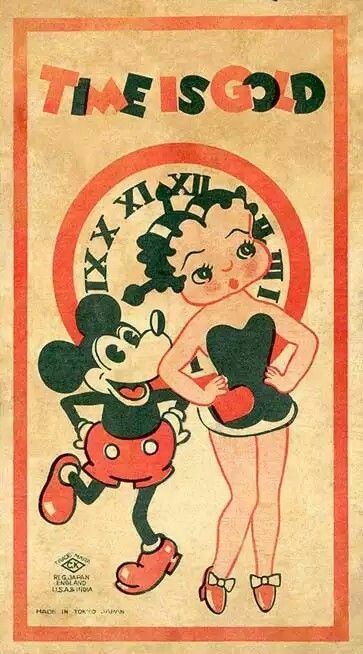 That Mickey Mouse and Betty Boop have endured so long is a tremendous tribute to the many artists whose talent, hard work and imagination brought them both to life, and makes it only fitting that we at Fleischer Studios should celebrate Mickey who - like Betty - remains as vital and beloved today as he was 90 years ago. While Betty and Mickey have been celebrated icons of animation for decades and to this day can be found on everything from shirts to plates to shoes - they even have their own emojis! - the fact that they were developed by competing studios means you won't find them together. Usually. The unlicensed products below - featuring Betty Boop and Mickey Mouse - were not authorized by either studio. Most were produced in 1930s Japan, where copyright infringement laws were not actively enforced. 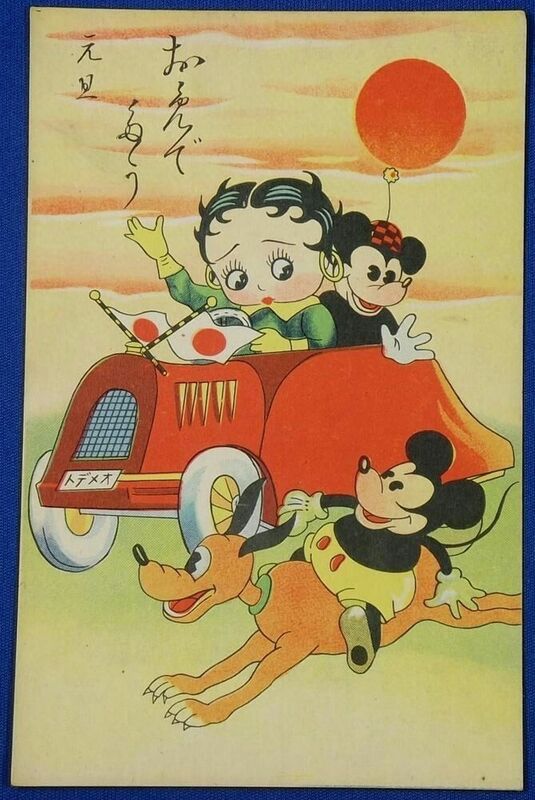 ​Made by small enterprises in Japan for the US popular market, no records were kept of who created many of the unauthorized toys, plates and cards featuring Betty Boop, Mickey Mouse and a whole host of other well-known characters. Though the artwork was often poor – sometimes only barely resembling the characters they were meant to represent - these inexpensive items, which were often sold through catalog companies such as Montgomery Ward or Sears, express the innovation and imagination of the manufacturers who created them. While the the products featured here were unauthorized, they are of historical interest and certainly speak to the longevity of two beloved figures of early animation who captured our hearts nearly 90 years ago, and are still going strong. Some Menko Cards are round. Can you spot some other identifiable Disney and Fleischer characters in the Menko Set below? A Japanese Sugoroku Board - the game is similar to the American game Snake and Ladders. This same image of Betty and Mickey can be found on a number of pieces. The packaging for these push pins includes Betty Boop, Popeye and Mickey Mouse. You can see the tops of the pins above the package. You can find images of more wild and whimsical Betty Boop products - like this whirligig that features Betty Boop and Mickey Mouse, from the collection of Len Ellis - on our Betty Boop in Japan Page. This doll-sized stroller was made in Spain in the 1930s. The game above is a ring toss game. These amazing shoes (above and below) are on display at the Peranakan Museum in Malaysia.